What’s in Jell-O® that makes it so jiggly? 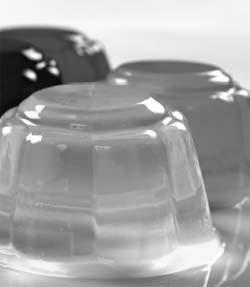 Gelatin, which is a convenient and pleasant term for the mixture of proteins and shorter peptides that are obtained from boiling byproducts of the meat and leather industries (mostly bones and pig skin), makes Jell-O® jiggly. The hydrogen bonds between peptide strands allows gelatin to form a network in the presence of water, which is what the physical structure of the gel is that you are familiar with. These hydrogen bonds can be disrupted with heat, which is why you boil Jell-O® before pouring it into a mold; once it cools back down, the network reforms in whatever shape the liquid is in. Gelatin, the main ingredient in Jell-O® desserts, is made up of proteins and peptides extracted from boiling leather and meat byproducts. Yummm.